No expense was spared in the creation of Kate Middleton's wedding dress. In 2011, the future queen walked down the aisle to Prince William in the wedding of the century. Sporting a custom-made Alexander McQueen creation, designed by Sarah Burton, the satin, tulle and silk gown featured 19th-century inspired intricate lace detailing on the sleeves. It culminated with a nearly 9-foot train, Cartier diamond tiara on loan from the queen and a semi-bustle at the back fastened with 58 ornate buttons. It reportedly cost £250,000 to make, although that hefty number is frequently dismissed. This image is embargoed to 0001 Friday July 22 for Print Media, all other Broadcast and online media the image is embargoed to 0600 Friday July 22. 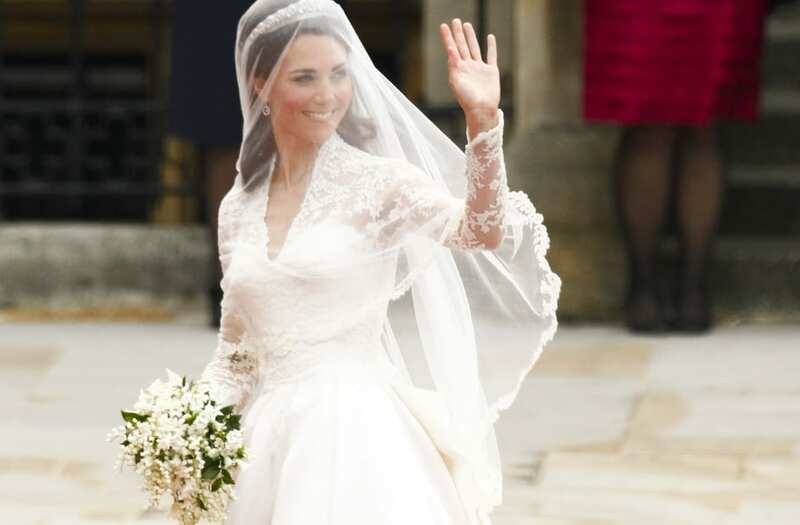 The Duchess of Cambridge's wedding dress, designed by Sarah Burton for Alexander McQueen, before it goes on display at Buckingham Palace, London, during the annual summer opening. Unbeknownst to most, the gown also included a hidden detail to make the Duchess' waist appear much tinier. The gown, which infused Victorian elegance with a modern twist, likewise featured many Victorian elements. Featuring an ivory satin bodice, mimicking that of a corset, extra padding was added around the hips to accentuate Kate's curves. "The padding was added as a nod to the Victorian style corsetry that inspires the Alexander McQueen brand," wrote Express about the iconic dress. Other outlets, too, noticed the extreme craftsmanship of the British label's creation and the image it achieved. In 2011, the Daily Mail's Liz Jones asserted, "What a triumph... The trademark McQueen padding at the hip made her waist look even smaller, while the corset meant her posture was that of a queen: upright, and formal." Kate's gown received comparisons to both Grace Kelly's, Queen Elizabeth's, Princess Diana's wedding gowns which similarly evoked a "storybook romance." To this day, Kate's iconic gown continues to influence the bridal world with long sleeves, dramatic trains and "ladylike lacing." And with another big royal wedding coming up in May, it's a wonder the sort of impact Meghan will have in the bridal world. Queen Sofia of Spain departs Claridge's hotel to attend the wedding of Prince William and Miss Catherine Middleton on April 29, 2011 in London, England. Prince William, Duke of Cambridge and Catherine, Duchess of Cambridge depart after their Wedding at Westminster Abbey on April 29, 2011 in London, England.